Power. Control. Mastery. Rival Sons are back with their sixth studio album Feral Roots—and it brings all three of these descriptors to life. It’s been two and one-half years since the band’s last release, 2016’s Hollow Bones, hit markets, but more surprising is the realization that the band itself is fast-approaching the 10-year anniversary of its first album, the self-released Before the Fire of 2009. Rival Sons have come so far since then—they’ve toured the world with Black Sabbath, sampled a few different record labels and endured one major lineup change (parting ways with Robin Everhart and welcoming Dave Beste to take over on bass in 2013). Through it all, the last decade has served as a testament to where Rival Sons stand in the blues-infused rock genre—that is to say, at the top. 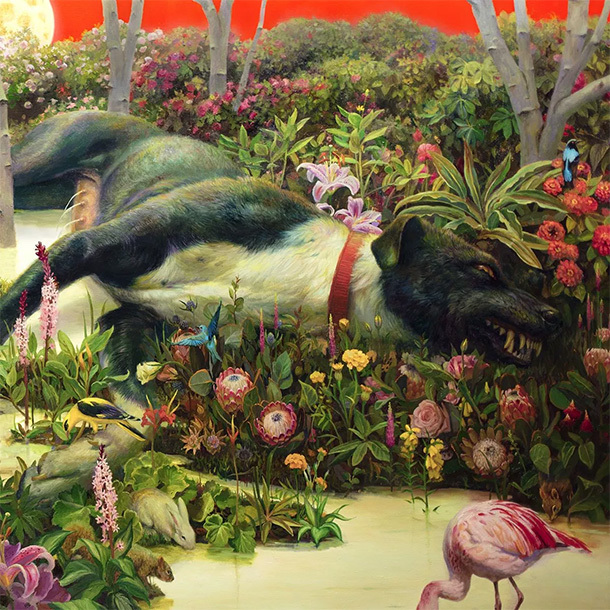 As a listener who’s been following Rival Sons since 2011, I approach each new album release holding my breath, wondering how long the band can maintain the established trajectory without losing its edge. The introductory riff of album opener “Do Your Worst” was the first indication that I could take a breath for the Dave Cobb-produced Feral Roots; it’s powerful musicianship at its best, the convergence of four experienced professionals who understand how to remain in control—with room to play—of their instruments. “Do Your Worst” is a rolling number with hefty rhythms that sets a solid rock-heavy tone for the album. The buzzy distortion that launches “Sugar on the Bone” follows suit, an appropriate setup for singer Jay Buchanan’s soaring vocals. Shortly thereafter, Feral Roots’ third track, “Back in the Woods,” gives drummer Michael Miley an opening to stretch out in the beginning and punctuate Buchanan’s lyrical spurts as the song continues. It’s here that the album settles into its groove—as Buchanan and Miley trade riffs, guitarist Scott Holiday and Beste work their own angles to accent the song. (Holiday gets several chances to shine throughout the album, notably when “All Directions” twists away from its early ballad format and transforms into a hard rocker, and Beste keeps the rhythms rollicking alongside Miley throughout “Imperial Joy.”) “Look Away” serves as another stand-out track, giving the album its fourth strong hitter in a row as the first 90 seconds of acoustic instrumentals surrenders to electric force. It’s one more example of how each musician brings his all to the studio, the skill natural in instinct and practiced in execution. The album continues weaving its way through all 11 tracks, the energy rising and falling in a calculated—though no less effective—way. “Shooting Stars” comes as a bit of a surprise as the album closer, its sound and structure different in the way that 2014’s Great Western Valkyrie’s “Destination on Course” was—only this time, Rival Sons has the Nashville Urban Choir chiming in on vocals. From start to end, Feral Roots shows Rival Sons performing as well as fans have grown to expect of them—and the experience is just as enjoyable now as it was a decade ago. Each song sung around my speakers like a well calculated live show ! Powerful and beautiful ! I agree 100% with your review ! 2) Listened to it only once because their job required to do so. With every listen I have a new favorite song while still wanting to listen to all of it… all the time. Rival Sons… hands down without a shadow of a doubt the best band in the world right now… and criminally underrated. Not only does the album have huge playback presence but their live performances really power through. Was lucky enough to be at the opening gig for this album tour. An incredible band staying right at the top of their game.